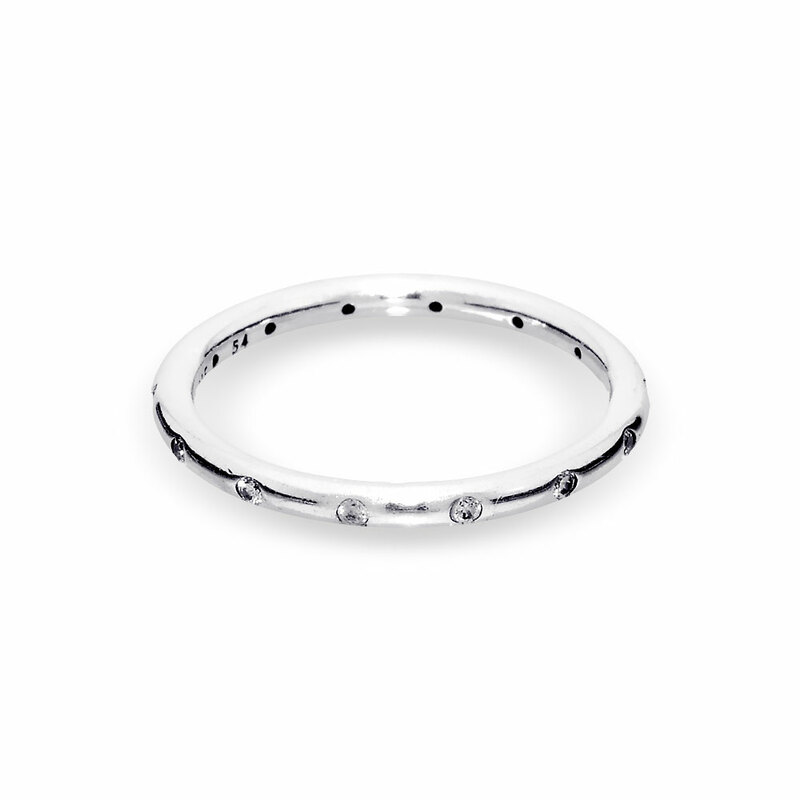 This stackable sterling silver band sparkles from inlaid cubic zirconia stones which lend a luxurious touch to the understated look. Buy PANDORA rings online or in store. Sparkling Droplets Ring - PANDORA is rated 4.4 out of 5 by 36. Rated 2 out of 5 by Christine1977 from Unhappy I brought thy his to wear as replacement wedding ring. Seeing as it says silver. Not silver plated. I'm unhappy to realise a month of wearing it has the plating removing on the sides. Very unhappy since theres also visible cracks around where stones are. I thought Panadora to be quality. It is not. Rated 5 out of 5 by LJWshop from Very Pretty I stacked two of these with an Alluring Brilliant Stackable Ring Clear CZ and they look amazing! Rated 5 out of 5 by MrsAndino from Beautiful ring I bought this ring a week ago to use as an everyday wedding band and I absolutely love it. I work in the medical field and I’m constantly washing my hands and putting gloves on and off so I didn’t want to use my wedding bands. I get a lot of compliments. The only down fall is the rings done come in half sizes. I’m a 6.25 size so I had to get a size 7 which is big on me. Rated 5 out of 5 by LoveitinChicago from Beautiful and Elegant Love this ring as a stackable to another ring I had received. It is simple elegance, liked it so much I purchased it for my sister's birthday. Ring runs a little big, so I would order a 1/2 size smaller that you usually wear. Rated 5 out of 5 by Liesel from Droplets stackable ring This is a prefect ring to wear with other rings I own. It is lovely and dainty, and perfect for all occasions. I am very pleased with this purchase. Rated 5 out of 5 by Emaw from Dainty this is a dainty stackable ring. perfect for a little bit of extra sparkle. with a thinner band, compared to others stackables i have, this little gem slips right in as an extra to a stackable pair. love it !!! Rated 5 out of 5 by Laniexx from Elegant and beautiful I stack two of these rings with the Fairytale Sparkle Ring and it looks absolutely amazing!! Had no issues with finger turning green or diamonds falling off. Just a perfect ring that goes with everything.